Besides chocolate, which if I'm not careful I can definitely eat too much of, I love, love, love - chicken and dumplings. I have it on my birthday, and sometimes on special occasions. I am a pasta a holic too! as a matter of fact we designed our remodel with a "Tuscan" theme...I love Italy that much. I adore Giada DeLaurentiis and have a few of her cookbooks and DVR'D her Everyday Italian.... and watched it daily for inspiration. I considered myself a pretty good "cook" until one day I decided I just needed to "lighten the load"
these days... I sort of reversed it. TASTE is still extremely important but health is first. maybe after I get better with my running program I can "afford" some more Giada's great cooking! 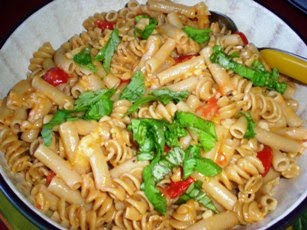 Wonderful tips about pasta! Well, about any food we can't control ourselves over, really. I have trouble eating a reasonable amount far too often; it's something I'm working on....but it's not an easy habit to break! I tend to walk a fine line between eating too little and eating too much other days - ugh. My favorite food....ahh...so many! Sushi though, is probably my all time fave. And chocolate...but then again, who doesn't love chocolate?! I am so with you. I eat very healthy but I love food so much that I tend to over eat. I have gained 10lbs since starting my food blog and I am trying so hard to eat what I want but eating smaller portions...let's hope it works. My food downfall is anything creamy or salty. I don't have a problem with pasta usually. I'm fine as long as I have a topping with loads of vegetables either kinda stir-fried or roasted. My problem would be more the garlic bread that went with it and BUTTER. Stuffing. Fresh made cookies. Those salmon patties! I could eat an entire plate of them! We all have demon foods that call our name, alas! wow, this struck close to home. i have been eating WAY too much good food. sure it is all clean eats and healthy, portions were my downfall! i am back on track now though. i usually try to eat slow and drink lots of water with my meals so i don't get outta control. i could eat 3 boxes of cereal and still be hungry, it is probably my favorite thing to eat!! To the extent possible, I try to be mindful before I eat my meals. That way, I know the amount that I'll likely be eating so that I can really enjoy the food when eating it. Yummy Pasta! I absolutely love frozen yogurt. I know it's not food, but it's just so good. I always have problems stopping with this stuff. That is why I limit myself to only getting it when i go out and not getting it for the house. We have similar tastes in food, because all of the food you listed is some of my favorites too :) I adore pasta as well, but I think the one food I have trouble over dosing on is bread. Whether it is yeasted, quick, savory, or sweet I LOVE bread. Carb girl here! I will pass on the meat any day, and have good old carbs! Great tips, especially the "This is not the last time you'll be eating pasta. You don't have to eat it all at this meal..." I subconsciously think this too often! mmm i had pasta last night for dinner....i could potentially overeat anything, and "it tastes so good" isn't really an excuse for me anymore. as for how to curb it, you know me and my sucking candies after a meal!!! I have the same problem with cereal. Too bad I do not have to cook cereal so the box just sits there and taunts me. I'm glad you've recognized and managed your love of pasta! Understanding why we eat the way we do is so important. Thanks for the supportive words concerning my international resident! I've told her multiple times she can always let me know if she needs anything. I can tell she is super sweet and she's already making friends on the hall! I ate a bit too much when pregnant with my kiddo, too! Course, I ate all the WRONG things then! Everything that I knew about nutrition went right out the window. I gained 60 pounds! Oh my God, who doesn't love pasta? I can't believe I rejected it for 4 years! Crazy me! I also think every single person has a problem in stopping when it comes to eating their fav food. It's normal! My fav food...would be oatmeal. I, too, indulge too much in the good thing. I sometimes eat up to 4 mega-bowls a day. Love that stuff! p.s. There also was a period when I was obsessed with nuts. I ate 3 lbs a day, no lie. OMGoodness my favorite food is soo cheese! I totally went to a winery and creamery today and sampled about 15 cheeses! But the food I can't stop eating is potato chips. I have a love/hate relationship with food. Shew yes, I do have a love affair with food - I suppose that's why I write and read food blogs! It's like my true calling. My favorite food? That's tough. I do love breakfast and oatmeal is my breakfast of champions. The fact that I have to cook it (or overnight it) means that portion control is built right in. To keep myself from overeating at a meal that is spectacular, I try to eat a good portion of veggies/salad first, then I can enjoy my meal almost guaranteeing I won't over do it. I could eat pizza and Mexican every day and never get sick of it! Ha, I almost always cook the whole box if I am cooking for 1 or for 6 people! I hear ya about the pasta.... that was my downfall too! lol!! HUGE bowls.. *blush* Now it's 1/2 cup of pasta, with LOTS of veggies! ;) I still get my pasta, but its a little "evened" out is all.. lol! Oh dear, it's never pasta for me...I cringe when my mother says "we're having Italian tonight". Now that I'm in college, I'll even throw a fit if I go home and she tries to serve me pasta. My love of food is in peas and beans, beans and beans and beans. When my mom used to leave chickpeas out for that night's indian style chickpea dinner, I would eat all of them and she would yell at me because she'd have to soak more. Put 16oz container of hummus in front of me and I'll eat the whole thing, no questions asked. The other thing is nuts. And, even though I make my own nut butters from scratch, adding things like protein powder and wheat bran to make a lot of calories go farther, I could eat an entire jar of nut butter at once too.